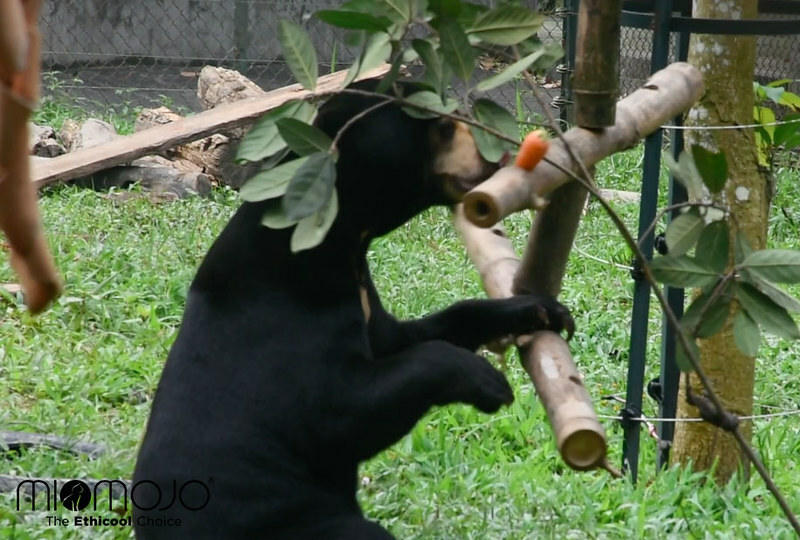 From climbing and palaeontology to nesting and a watermelon-eating contest, these rescued sun bears know how to enjoy sanctuary life. Poached from the wild as cubs for the exotic pet trade, sun bears Aurora, Goldie, Sassy, Annemarie, Murphy and Layla sadly will likely never be able to return to the wild. Without survival skills, dealing with residual mental trauma and having been habituated to the presence of humans, the best that can be done for these six precious individuals is to give them the happiest, most natural life possible in sanctuary. And at Animals Asia’s award-winning bear rescue centre in Vietnam, that’s exactly what all six bears receive every day. This weekend, the rambunctious youngsters ran out into their enclosure to find the world had changed, just as it does every week. In their large, grassy playground they found a huge new sand pit. Here little Layla foraged and dug gently in the sand like a palaeontologist, her curiosity piqued to investigate what could lie underneath waiting to be found by an inquisitive little bear. In another area, Goldie found a tangle of bamboo dangling from the air. He sorted through the puzzle feeder finding carrots and tasty fresh leaves waiting for him. Wee Murphy, the youngest bear in the gang, took himself away to a quiet corner where he found a pile of fresh straw. He piled up the straw and made himself a comfy nest, just the way he likes it where he enjoyed a mid-afternoon nap. While he was sleeping, Goldie and Aurora – the newest member of the group – got competitive. Both bears just love watermelon and they were finding sweet slices of this treat all over the sanctuary. They seemed to race each other to see who could devour the most. And while all the excitement was going on, Layla decided she was going to take the day at a more sedate pace. 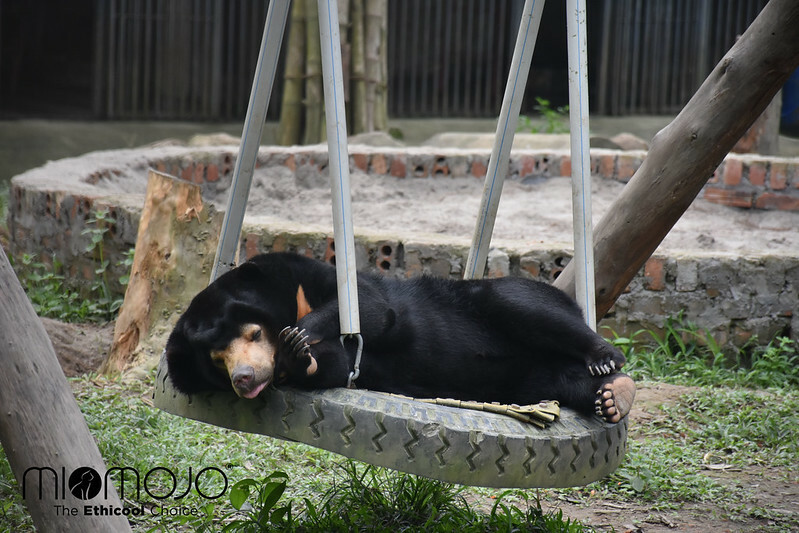 She clambered on to one of the sanctuary’s tyre swings and found that the soft rubber and gentle swaying motion made the most delightful bed for rocking a tired little bear to sleep. This large, outdoor enclosure – filled with trees, a swimming pool and climbing frames – constantly changes to make sure every day is filled with excitement and new discoveries for all six bears. This allows the rescued orphans to express natural behaviours such as foraging, while the group provides emotional support for each other – a situation made possible by the generous support of Miomojo, a fashion company which has part-sponsors the group for nearly a year. The Miomojo Cub House is part-funded by Miomojo – a responsible fashion company from Italy making gorgeous fashion accessories that don’t harm animals or the environment. Their Ethicool collection is available now with a percentage of proceeds funding Animals Asia’s work to care for the Miomojo Cub House bears.